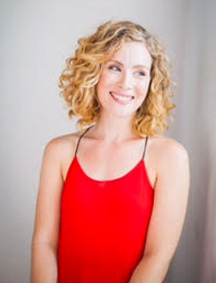 Emily is a graduate of the Yoga Space Teacher Training Program. She teaches Vinyasa, Hatha and Restorative Yoga and is a sought-after favourite on the Therapeutic Yoga team. Having practiced Yoga since her teens, her understanding deepened under the instruction of Robert Webber in Halifax. Since then and under the caring guidance of Kathryn Beet, Patricia White and Hali Schwartz, Emily has articulated her own passionate style of teaching. Her intention is to create a strong and grounding class, balanced by a meditative flow committed to keeping the mind calm. Her significant experience as an actor enables her to keep breath and body awareness at the for front of the class experience. She welcomes everyone of all abilities to join her. “One only need move to the point of stretch to help quiet the mind”! “I attended Emily’s Restorative Yoga and I enjoyed it immensely.” – Jean C.
“I really love Emily’s early morning Vinyasa class. I can very rarely make it, unfortunately, but when I do I love it.” – Kendell D.